My playbill from “Dear Evan Hansen” at the Music Box Theater. I laughed, I cried, I loved it. 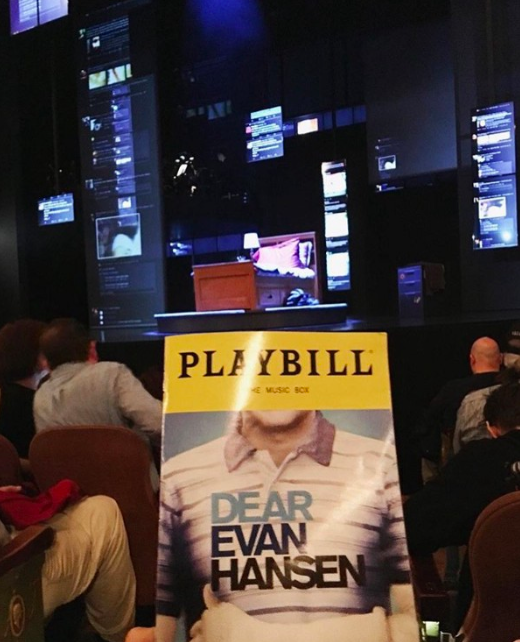 Last week I went to see the new hit Broadway musical “Dear Evan Hansen.” And, yes–sometimes the clichés are useful–I laughed, I cried, I loved it. And like all great works of art, it stayed with me and made me think. It’s a powerful portrayal of our present, and perilous, moment in history: the age of social media and social anxiety. Without revealing any spoilers, the musical is centered on a lonely, anxious teenager, Evan Hansen, and the trajectory of his relationships with a girl, a friend’s family and his own family. But fueling his story is this combustible mixture of social media anxiety and affirmation, one that’s increasingly hard–not just for teens, but for all us–to disentangle. So the question is: What’s the cost of allowing this powerful social technology to become such an important vehicle for our need to connect, belong, and even feel joy? Does social media truly answer those needs, or does it simply appear to while ultimately just amping up social anxiety? • Almost half of smartphone owners say they can’t live without their smartphones. • Over 70 percent of Americans sleep with or next to their smartphones. • On average, people spend 5 hours a day on their phones and check them 85 separate times. • Each day we send 500 million tweets and 50 billion messages on WhatsApp. • There are now 500 million active users on Instagram, who have so far shared 40 billion photos. And this isn’t necessarily increasing our connection, but, more and more, taking the place of actual connection. According to a survey by Pew, 89 percent of cellphone owners say they used their phone during their most recent social gathering, and 82 percent say when they use their phones in social settings it damages the interaction. And the rise of cellphones, virtual connection and social networks coincides with a drop in actual social groups. Since 1985, the number of those who say they have no one to talk about important things with has gone up nearly three-fold. And just how dependent on our phones are we? According to a recent poll, 90 percent of Americans experience anxiety when our battery is on low, and 71 percent won’t even lend their charger to someone else for fear of not being able to charge their own phones. And what has this incredible compulsion to be connected and interact virtually, especially over social media, gotten us? More anxiety than happiness, it would seem. Researchers at Regis University in Denver set out to look at how the size of students’ social networks corresponded to their health. Since we know that a large real-world social network is good for us, the researchers assumed they’d find the same correlation with virtual social networks. Instead, they found the opposite: The larger the Facebook network the students had, the higher their rate of upper respiratory infections was. Similarly, researchers at the University of Pittsburgh found that the more social networks a person used, the more likely they were to suffer from depression and anxiety. So why are we doing it? What fuels the addiction? Researchers have looked at this question, too. We humans are hard-wired to connect with others, and partly that means allowing ourselves to be known. According to one study out of Harvard University, we spend about 40 percent of our time on self-disclosure. And when we put ourselves out there, we feel pleasure when we’re affirmed, but when we’re not, we often feel shattered. In a fascinating study out of UCLA, Matthew Lieberman and Naomi Eisenberger had participants play catch with two others on video. But the two others were in fact virtual and would start to exclude them. Not only would the rejected participants feel very upset at the rejection, they had increased activity in the part of the brain that processes physical pain. So while we’re constantly chasing affirmation, we’re also constantly getting rejected, which our brain experiences as physical pain. And social media is like a perfect machine to deliver both affirmation and rejection, 24 hours a day. The catch here is our definition of being alone doing nothing. Being alone is in fact the stuff of poets, mystics and philosophers and, as Paulo Coelho put it, “For those who are not frightened by the solitude that reveals all mysteries, everything will have a different taste.” The world wide web is often talked about as being vast, unbounded and limitless, with an infinite capacity to grow. But so is our interior world. In The Shallows: What the Internet Is Doing to Our Brains, Nicholas Carr writes that, yes, we need time to “operate the machine,” but we also need time to “sit idly in the garden.” But as our virtual social worlds are consuming more and more of our lives. We’ve lost our inner gardening skills — and too many of our gardens are untended, overgrown and as a result seem frightening. But the reality is that we can’t escape ourselves. As Jon Kabat-Zinn put it in his book Wherever You Go, There You Are, “If we hope to go anywhere or develop ourselves in any way, we can only step from where we are standing. If we don’t really know where we are standing…we may only go in circles.” Or go in an endless and fruitless search for happiness on our screens to avoid ourselves. Online we connect through shared preferences; offline we connect through shared experiences. Social media encourages us to define ourselves by our exterior life, often at the expense of even knowing that we have an inner life. But when we give ourselves more time to discover the essence of who we are we finally experience what all major philosophies, from the Stoics to the Taoists, have promised: that true joy is independent of circumstances — and certainly independent of how many likes our dress or our meal got on Instagram. So how can we swing the pendulum back and reclaim some time and space for ourselves to cultivate our inner gardens? One encouraging sign is the growth of the Slow Web movement begun by 33 year-old Jack Cheng, a startup founder and novelist. The latest iteration in the Slow movement that began in Italy with Slow Food in 1989, the Slow Web movement aims to give us, as Cheng puts it, a “gentler, saner experience of the Web.” Carl Honore, author of In Praise of Slowness says it will be a challenge, but there’s no reason the web — along with humans — always has to operate at breakneck speed. “We’re up against the Web industrial complex,” he says, but the Slow Web movement is about “humanizing the pace of the Web again.” It’s not about getting rid of technology, but using it at a human pace, making technology adapt to us, instead of the other way around. To quote Coelho again, “The great wisdom of life is to realize that we can be the master of the things that try to enslave us.” Right now we’re in danger of creating a society and raising a generation unable to enjoy the benefits of solitude, personal reflection and a deep connection with others. Fortunately, there’s still time to change direction.